Who can resist the cuteness of the penguin? Dressed up in their evening best and elegant gliding through the water, penguins inspire an exotic land far away in colder climates. 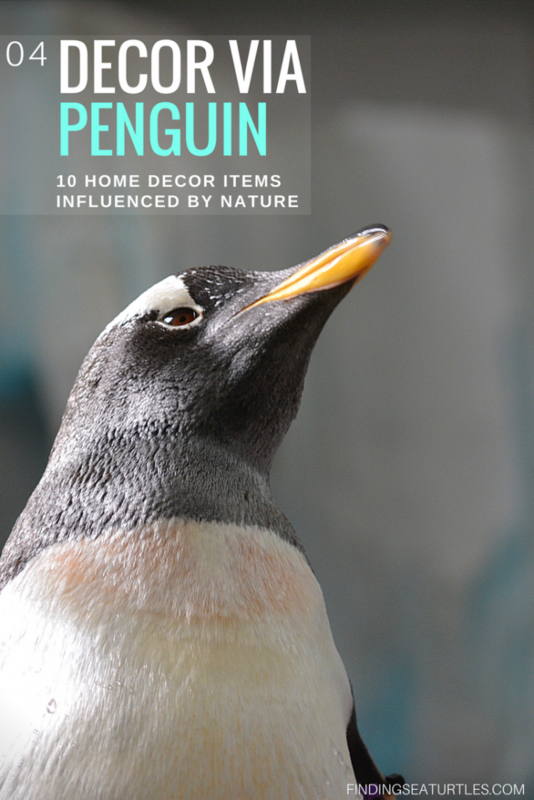 Incorporate some penguin flair into your coastal home decor. Their playfulness is a perfect addition to kids spaces while their formal ‘tuxedo’ look blends elegantly into your stylish ‘adult’ spaces. We’ve done a bit of scouring and found ten cool items that will help celebrate our favorite ocean bird and help us look good doing it! Look – even James Bond drinks Martinis when he’s dressed up in a tuxedo. So it’s no surprise someone thought a Penguin cocktail shaker makes perfect sense. 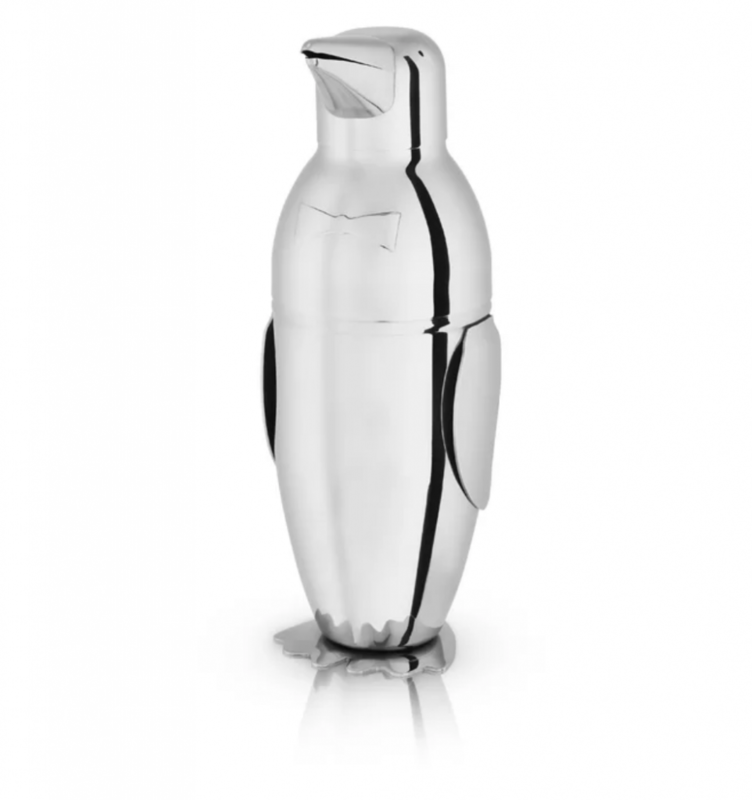 Looking handsome in a bowtie, our friend the penguin has been idolized in 18/8 stainless steel in the functional shape of a two-piece cocktail shaker. This is a handsome addition to any coastal home’s bar area and will naturally be conversation starter when you have company. Stands 9 inches tall and holds 18 ounces. Penguins make for good graphic art given their naturally contrasting colors. This bold graphic print is simple and would look good against any neutral wall color. We love the simple lines and the heavy use of white space for a cleaner aesthetic. Too many photos and prints incorporate snow and ice and are too ‘cold’ for our taste in the house. Looking for a different piece of art for a dead space in the hallway or even a larger bathroom? Give the penguin a try. Available in wrapped canvas on a wood frame and in 7 seven sizes from 5″x7″ all the way up to 48″ x 32″. 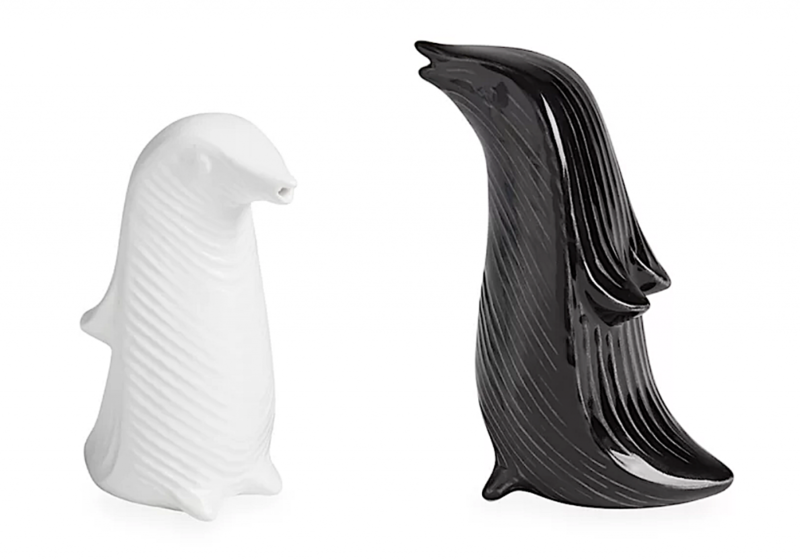 We’re big fans of Jonathan Adler’s line of ceramic animal figurines. While they are typically white glazed in a simple matte, this set of salt and pepper shakes makes double use of the black and white coloring of penguins. A fun way to add some Penguin to your table and functional too! 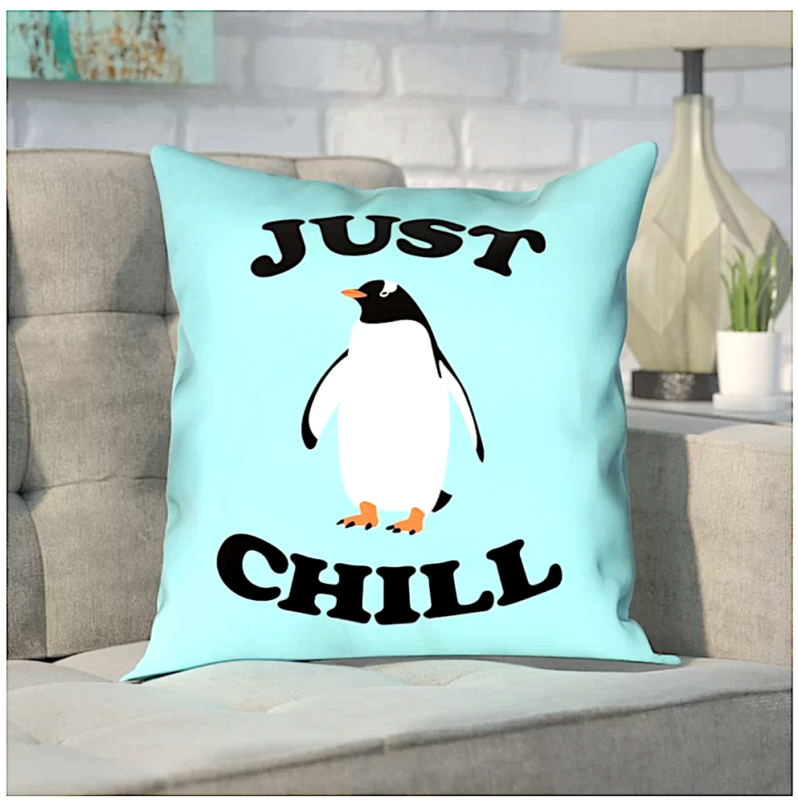 We’re not usually big on quotable art or decor, but the penguin just begs you to be playful with this pillow labeled ‘Just Chill.’ We expect nothing less of this mandate for the beach house, so we made an exception in this case! Beautiful turquoise fabric and available in three sizes (16″, 18″ or 20″ square) to be added to a casual family gathering space on a couch or sectional. Would look great in a built-in breakfast nook as well. A bonus is that the fabric is rated for indoor and outdoor with waterproof and mildew-proof properties. That means you can toss this outside on a covered porch or deck. Keep in mind that there isn’t any UV-resistance listed so it may fade under heavy sun exposure. Have you watched a penguin walk? Then you know what they mean when they call it Penguin Swag or swagger. The waddle walk is one of the endearing features of our feathered friend and is beautifully captured here in a watercolor print. 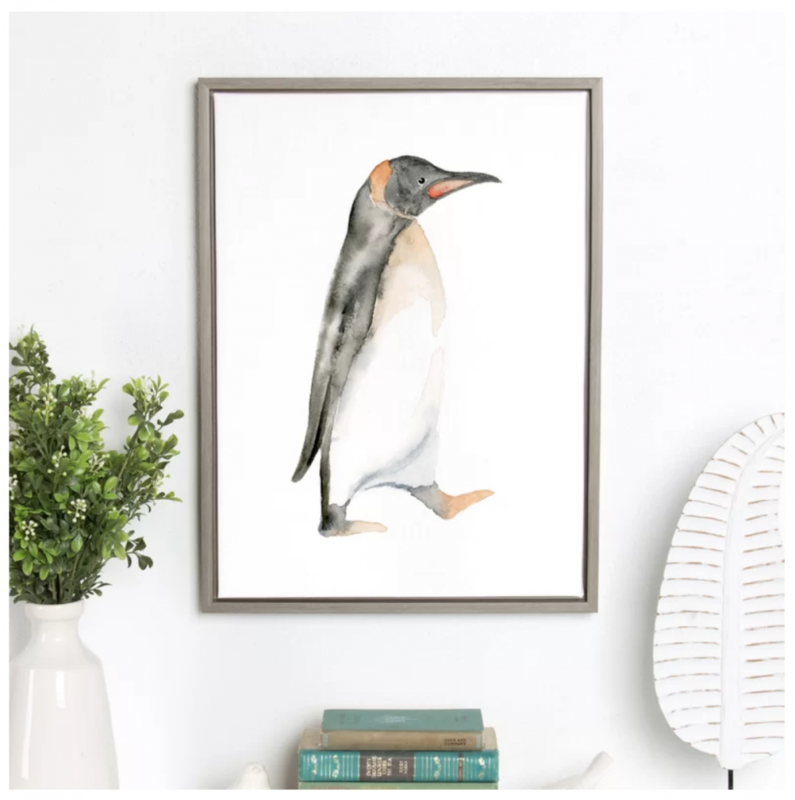 The softer lines of the watercolors help make this a great way to incorporate the penguin into a calmer setting like a bedroom or sitting area. Measuring a sizable 18″x24″ and pre-framed in a grey oak-stained finish to compliment most decors. 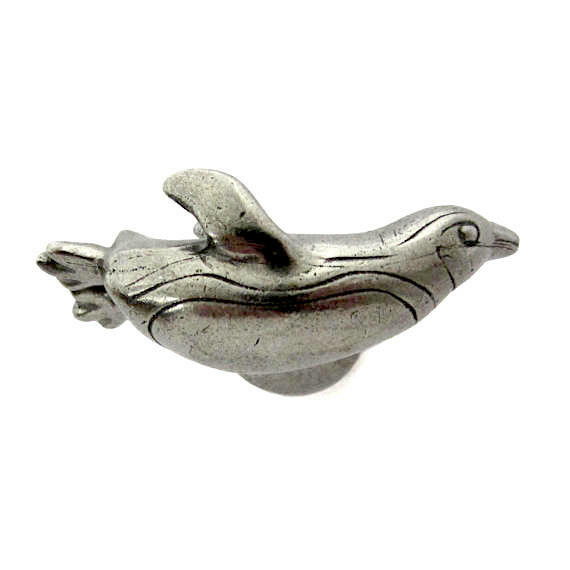 Tcustom (Chris Tayler) on Etsy offers this cute drawer pull or knob that would add just a touch of penguin whimsy to that bathroom vanity, makeup vanity or your children’s desk drawers or dresser. Pewter (look?) finish in a sizable 2″ wide pull on a 1″ standard bolt. Available in right- and left-facing orientation so you can customize to your application. 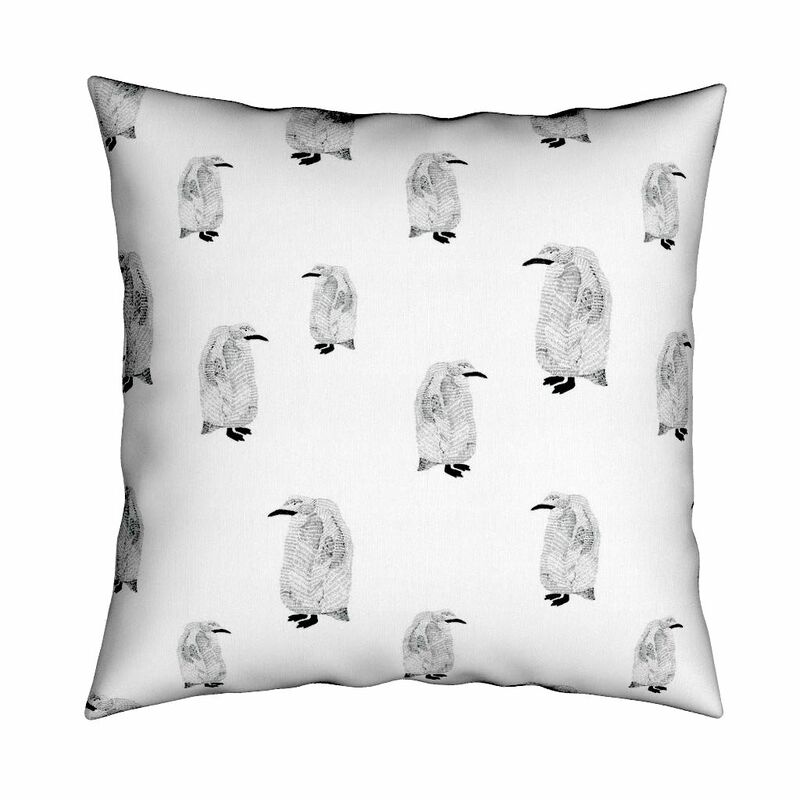 Another pillow option in a more subtle, monochrome pattern featuring the penguin. This pillow from Roostery is available with the print on 7 different fabrics ranging from a more basic eco-canvas to suede and velvet. Pillow insert sold separately. Artiford is a Dutch furniture manufacturer that was founded in 1890. 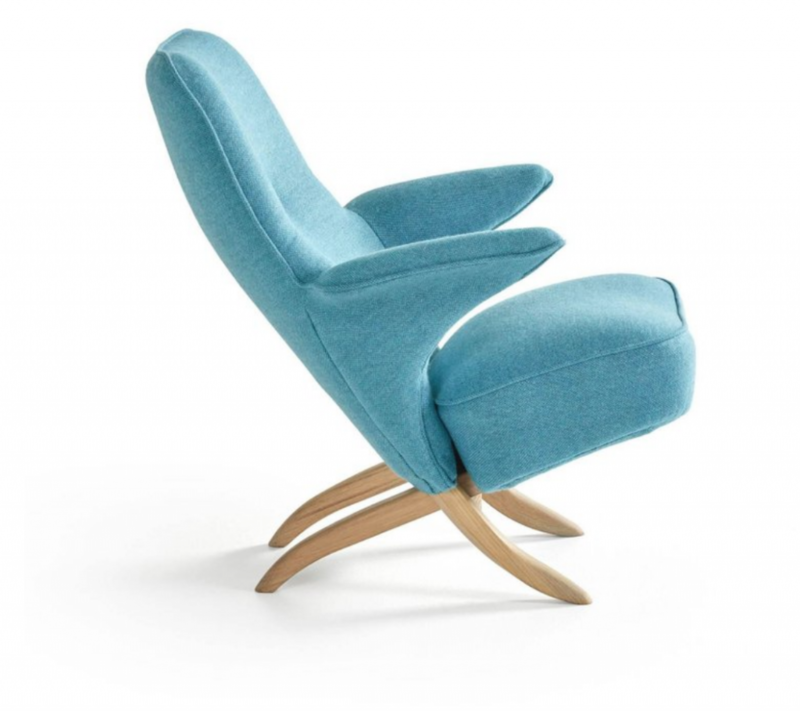 To celebrate its 125th anniversary, it is re-releasing this unique chair designed by Theo Ruth originally in 1953. Not only does it have the clean-line aesthetics of northern Europe, it happens to be inspired (or interpreted) by our friend the penguin! You don’t have to squint too much to see the resemblance in the ‘fins’ arm rests and the strategically-placed buttons for eyes. 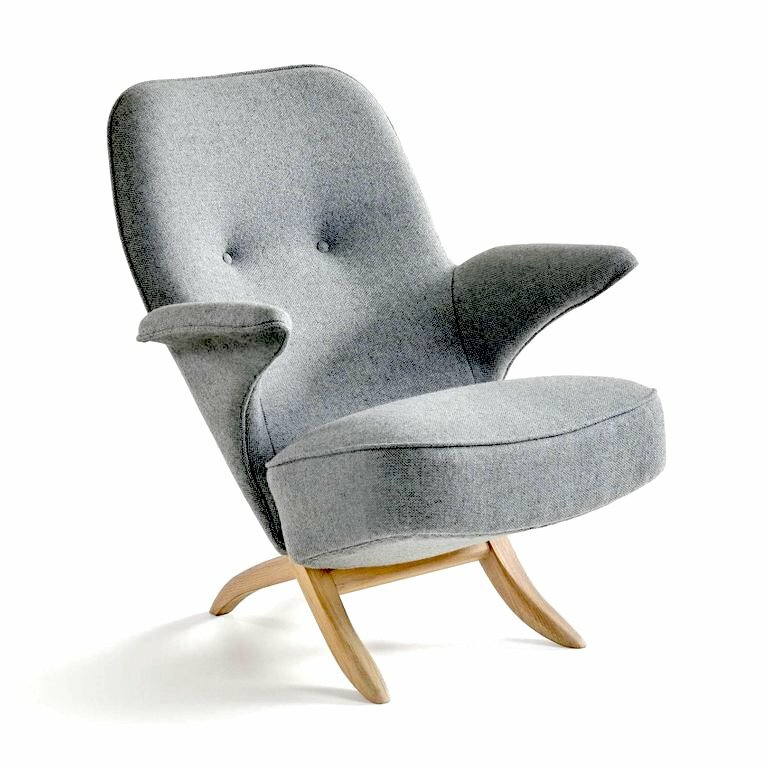 Warning – this is a pricey item and custom made to order, but if you love the natural oak and Bute fabrics, the chair with its penguin silhouette would be a very unique statement piece in your coastal decor home! Expect to wait 2-3 months for production and shipping from Europe is additional. Available in 5 fabric colors. Hot pink has been all the rage in pop / hip decor for decades and to this day still makes an appearance in various aesthetics. 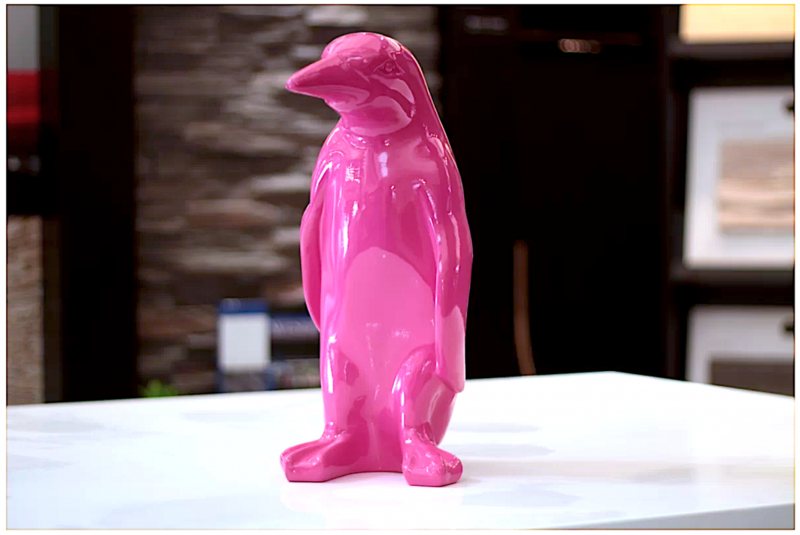 If you can find a place for hot pink in your home, this resin figurine of our playful penguin friend should fill the space perfectly. Maybe atop that side bar? Need an accent for an otherwise monochrome palette? If you’re already swimming in pink, go for it. But even if you keep to ocean or natural tones (typical of coastal) this gal will add a fun pop to any space. We’ve found hot pink stands up well against the current vogue marble counters and surfaces. Or stand her up in front of some greenery and watch the flamingos become envious! Stands 16″ tall and is even coated for water and light UV resistance in case you have an outdoor space for her. We couldn’t finish this list without an absolutely adorable add to that nursery or children’s space. 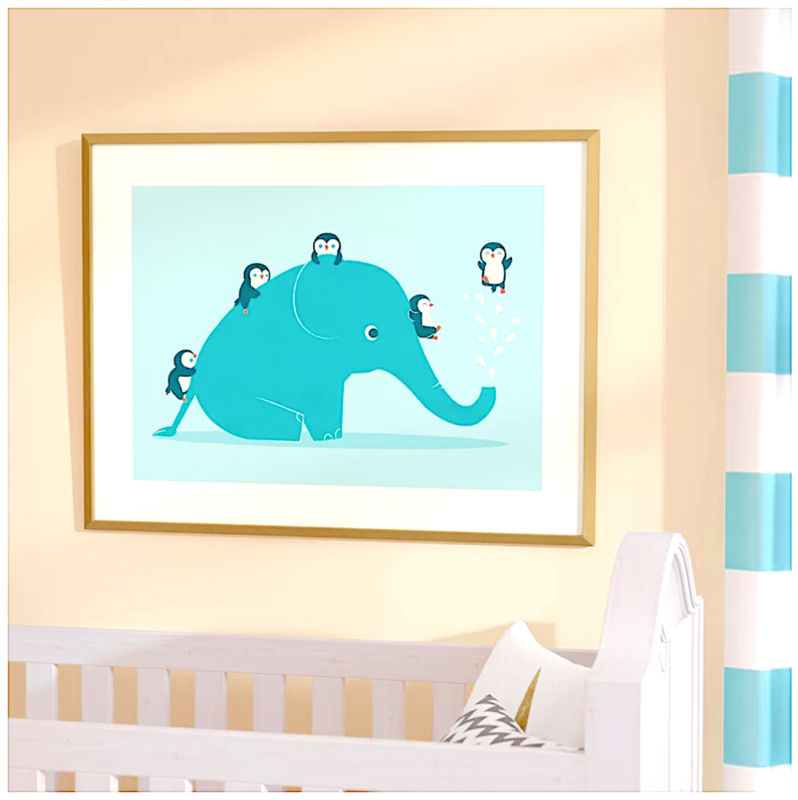 A cute print of a group of playful penguins climbing up and sliding down a friendly elephant. In pretty turquoise coastal colors, it won’t be hard to find a place to hang this piece. Measures a total 27″ tall x 25″ wide and is pre-framed in a natural wood color. 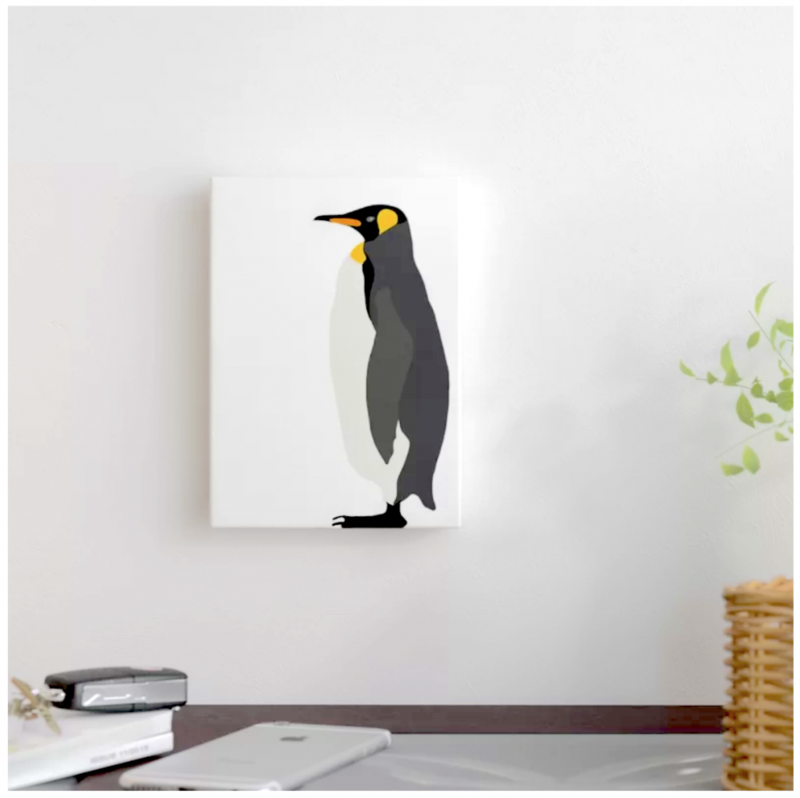 Are you a penguin aficionado? 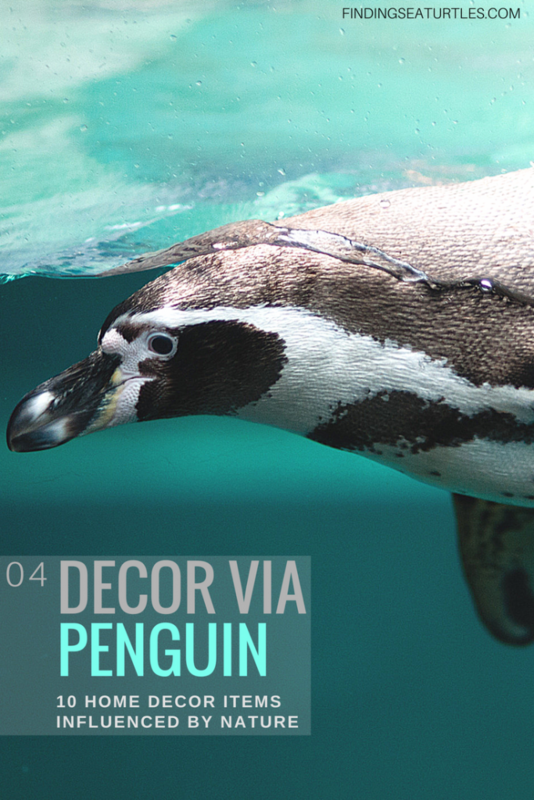 Did you know not all penguins live in cold climates? Or that they all live south of the Equator? Check out our Sealife Spotlight post on Penguins where we highlight some of the most interesting facts about these fun birds. As always, we hope you love our finds and please leave a comment or contact us if you have any questions. Thanks for reading!